This exhibition features a selection of drawings made by Cruz Reynoso on his case notes while serving on the California State Supreme Court, as well as works by other Chicano artists. Chicano art is often produced for the community, a deeply religious community. Rather than artists hiding their faith tradition and producing art with only secular concerns or embracing traditional European religious visual language, the Chicano community creates art about protest and social justice which is fundamentally rooted in the community’s faith tradition. Above, drawing by Cruz Reynoso; right, La Curandera Maria Sabina by Xoxhitl Nevel Guerrero. Cruz Reynoso, as Director of the California Rural Legal Assistance program, was an active part of the Chicano Civil Rights movement in California. Eventually, he became the first Latino on the California State Supreme Court, served as vice-chair on the US Civil Rights Commission, and received the Presidential Medal of Freedom from President Bill Clinton. But initially, he aspired to be an artist. He lived with and worked for his high school art teacher and her commercial artist husband for the last years of high school and the beginning of college. 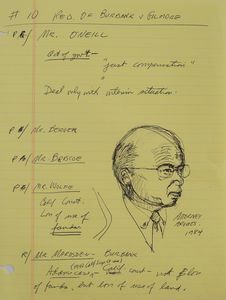 He continued to draw through-out his legal career including on the case notes he took while on the California Supreme Court. The ethic which drove Reynoso’s civil rights work is rooted in his Catholic upbringing, shaped by the fifty years he spent in Baptist churches with first wife, and may have found its closest religious expression in the Unitarian Universalist Church he now attends. The exhibition reflects Reynoso's life-long interests in social justice and religion, principles found in the works of many other Chicano artists. Rondall Reynoso organized the exhibit as part of his PhD program at Graduate Theological Union. Funding for this exhibition provided by the Jane Dillenberger Fine Arts Endowment.